The TL2 is a 2-channel precision bench top thermometer offering a higher level of metrology accuracy in a very affordable package. The TL2 is a complete NIST traceable system that is ready to use, right out of the box. Based on successful TL1-R technology, the TL2 has been developed for laboratory applications demanding high precision reference thermometry with the added versatility of 2 channel measurement. To fully realize the benefits of 2 channel measurement, the TL2 provides data logging capabilities with the convenience of PC or USB flash drive interface. The ergonomic design and large display make the TL2 ideally suited for use as a calibration reference thermometer and for recording temperature-time based data. TL2.1.3110 ThermoProbe TL2 precision digital thermometer, Single Sensor, -20 to 160 °C (-4/320 °F), 3/16 x 12″ stem, 0.001 resolution, +/- 0.03C Accuracy. Supplied with an ISO/IEC 17025 accredited, NIST traceable certificate of calibration @ -20, 0.01, 50, 100, 150 °C and storage case. TL2.1.3210 ThermoProbe TL2 precision digital thermometer, Single Sensor, -20 to 160 °C (-4/320 °F), 3/16 x 12″ stem, 0.001 resolution, +/- 0.03C Accuracy. Supplied with an ISO/IEC 17025 accredited, NIST traceable certificate of calibration @ -4, 32, 110, 212, 302 °F and storage case. 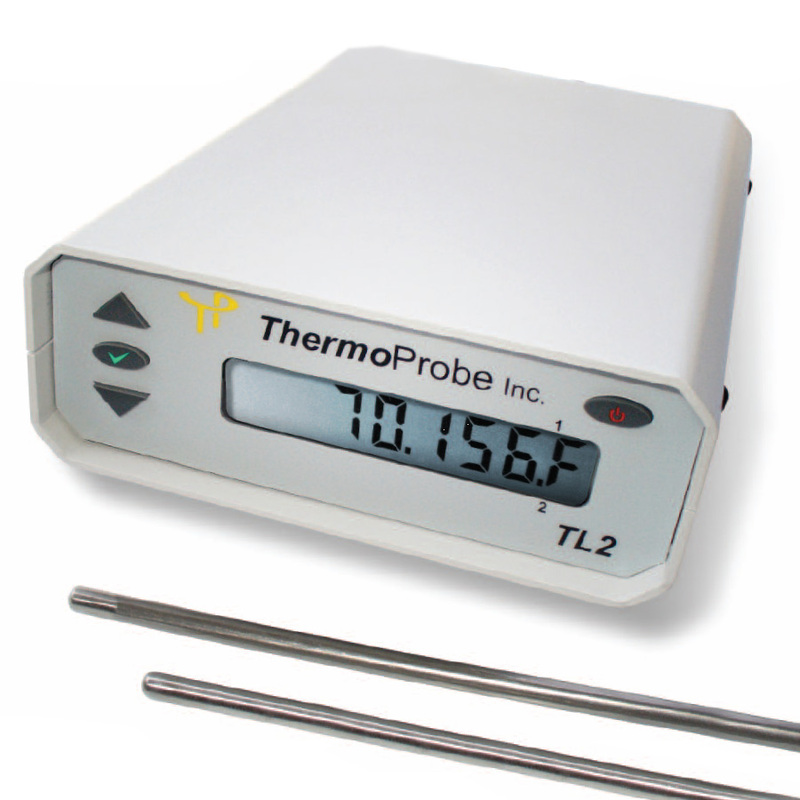 TL2.2.3110 ThermoProbe TL2 precision digital thermometer, Two Sensor, -20 to 160 °C (-4/320 °F), 3/16 x 12″ stem (x2), 0.001 resolution, +/- 0.03C Accuracy. Supplied with an ISO/IEC 17025 accredited, NIST traceable certificate of calibration for each channel @ -20, 0.01, 50, 100, 150 °C and storage case. TL2.2.3210 ThermoProbe TL2 precision digital thermometer, Two Sensor, -20 to 160 °C (-4/320 °F), 3/16 x 12″ stem (x2), 0.001 resolution, +/- 0.03C Accuracy. Supplied with an ISO/IEC 17025 accredited, NIST traceable certificate of calibration for each channel @ -4, 32, 110, 212, 302 °F and storage case.